While I'm still going to add things as and when I have a sense that this blog may have run its course in its present incarnation. At the moment, my main priority rather than writing any new material is to compile a 'best of' as suggested last year and cap off eight years of the blog. - going back through and sorting some HTML formatting issues in older posts to make the blog fit for purpose and then continuing to use it for whatever purposes I see fit. - or making a new start on a new platform because the thought of wrestling with HMTL makes my teeth hurt. Maybe doing something different or a little more focussed. I suspect the act of compiling the A-Z of Magpie Moth or whatever it ends up being will perhaps make my mind up for me. Anyhow, for now, I'm still here. plus an honourable re-read mention for Edward Said's Orientalism - still an excellent book. Somewhat to my surprise - this blog has been going for eight years and over 600 posts. Despite occasional protestations to the contrary, it's has remained as it started - a personal space for me to write about whatever felt like a good idea at the time. It's always been a zone of freedom rather than something I had to do for this, that or the other reason. Ultimately, that accounts for both its persistence and its lack of (a single) focus. For a while now, I've toyed with the idea of going back through the blog, picking out a representative set of posts and editing them into a small compendium for an probably imaginary audience. This seems like as good a moment as any to look back and see what stands out. Reviews (mainly books and music with a side order of cinema) have tended to dominate, in as far as anything has. Its a form I feel at ease with going right back to my dabblings in student journalism and lends itself well to short updates. But they can - and for me often are - a way of approaching the personal from a flanking position too. Alongside these reviews you'd find over the years a whole kitchen sink of thoughts on the above plus politics, activism, organising and even the odd (in both senses) attempt at poetry. Taken together - who knows - they might even amount to a coherent position? This is where it all started and it's a bit tentative. There's really only three contenders for inclusion in any compilation and they'd all need a bit of work. - A rather nice, if short on full sentences, exploration of how magic might work in an eighteenth century fantasy. - A rough transcript of a talk I gave at Lewisham Unitarians about the need to go beyond 'mere tolerance' of others' beliefs and work towards a positive appreciation of difference. - An overly florid review of Inception, which either needs half the adjectives and adverbs removing or extending to twice its current length. Either way, it needs to be much less dense. Ah! Now it starts to get more interesting. I really, really, really didn't like fantasy parody Your Highness (but then it only scores 28% on Rotten Tomatoes, so this may be shooting fish in a barrel). I preferred Thor, or at least my alternative mumblecore reading of Dave Thunder's adventures. It's short, but I remain taken with a piece of Hercules And Love Affair and the politics of dancing. Also - the blog exhbits first signs of a recurring annoyance with nostalgia (heavily indebted to Simon Reynolds Retromania) in a review of Plush's album Fed. We're now getting up to 60-odd posts a year. Granted, a lot of these are photos, quotes and Christmas doggerel, but still - 60 posts! 2012 was when my interest in metal really flared up (I blame living in Birmingham) and I wrote a series of posts trying to justify account for this of which these are the best. How I learned to stop worrying and love metal. Sort of. A review of early Tanith Lee is also interesting for being a first crack at praising the strangeness inherent in much of the best fantasy, despite how much Eddings and his imitators try so squeeze it out. It's also a reminder of how often I misspell 'weird'. I'm still rather pleased with my idea of 'thresholds' - curated augmented reality spaces - even though I've yet to do much anything with it. The first of two prolific years. As an outsider exploring the margins of metal I continued to turn up gems - it's this year that the love affairs with Alcest (AKA the black metal Nick Drake) and Ulver started. Lovecraft and his buddy Clark Ashton Smith, as well as Michael Moorcock's Jerry Cornelius, all get a look in on the weird fiction front. Other genre fiction reviews of note included Spider Robinson's Callaghan's Crosstime Saloon, Robert Silverberg's Lord Valentine's Castle and Patrick Rothfuss' The Wise Man's Fear. I didn't often write about non-fiction but this piece on Richard Wilkinson and Kate Pickett's The Spirit Level is pretty good. I also managed to review both The Hobbit and the first of the Jacksonian cinema trilogy, as well as getting a surprising amount of material out of the morality of force while reviewing Olympus Has Fallen, Iron Man 3 and Prisoners. This year's ideas I didn't do anything much with: mapping a cartography of hope and festivals as neartopian spaces. 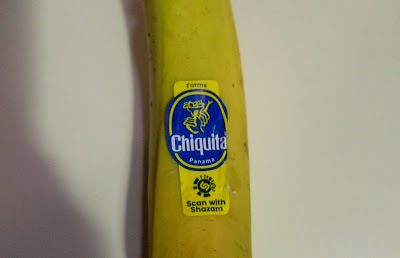 More everyday science-fiction here courtesy of multinational banana corporations. 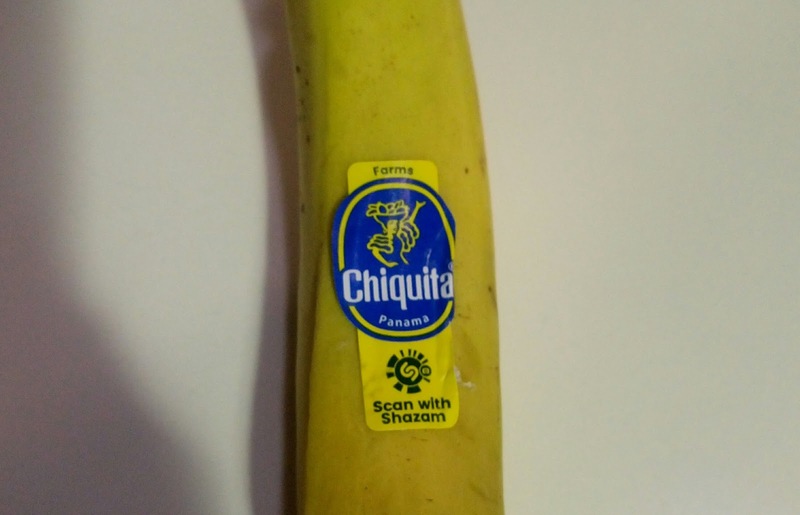 I don't Shazam, but one of my colleagues does (it works on the photo as well as the banana itself) and brought up a 3D rendering of a rainforest. 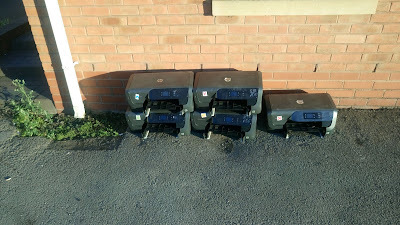 Gangs of obsolete technologies huddle on street corners, radiating greyscale menace. Alright, let's go high concept. 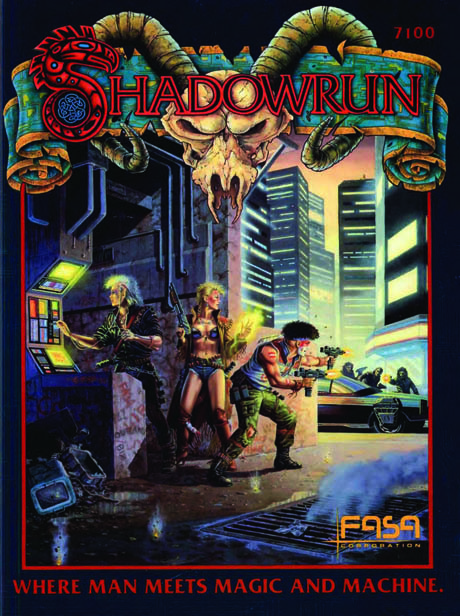 Because what separates Shadowrun (online home here) from the genre collages of Rifts and Torg is that it tries, and to be fair mostly succeeds, in explaining why elves, dwarves and orcs should be runnng round the back streets of Seattle looking like members of The Sigue Sigue Sputnik Fan Club. To understand Shadowrun you have to know how big a deal cyberpunk was in the late 80's. Influences from fiction (Neuromancer et al), film and music had combined to create an aesthetic and a set of tropes that were very marketable. Gunmetal bionic limbs! Mirrorshades! Cyberspace! Defy the corporate system in tight leather trousers! Hairspray! What pure cyberpunk role-playing games foundered on, in your correspondents opinion, was translating the moral ambiguity of the genre into a satisfying gaming experience. Usually - at least if you were a teenager who had cut your teeth on DnD and Games Workshop, any complexity tended to be discarded in favour of those cool cybernetic implants and those outsize guns in a nihilist race to the bottom. By combining fantasy and cyberpunk - the old favourite and the flavour of the month - Shadowrun gave itself more options. Rather than banging your head repeatedly against the nightmare of dystopian capitalism, it opened the door to myth, magic and the possibility of hope. And nothing demonstrates that more clearly than the narrative of how enchantment returns to the moderm world, with the indigenous peoples of the Americas regaining the use of their traditional magics to reclaim much of the continent east of the Mississippi. Shadowrun says another world is possible. Which is most decidedly not a cyberpunk sentiment. One can see how the genre-blending understandably irritated William Gibson and wouldn't work half as well in a literary context. But it goes to show a) that books and role-playing games are different media with different needs and in particular that b) role-playing narratives often benefit from being anti-hegemonic in a way which fiction simply doesn't need to be.